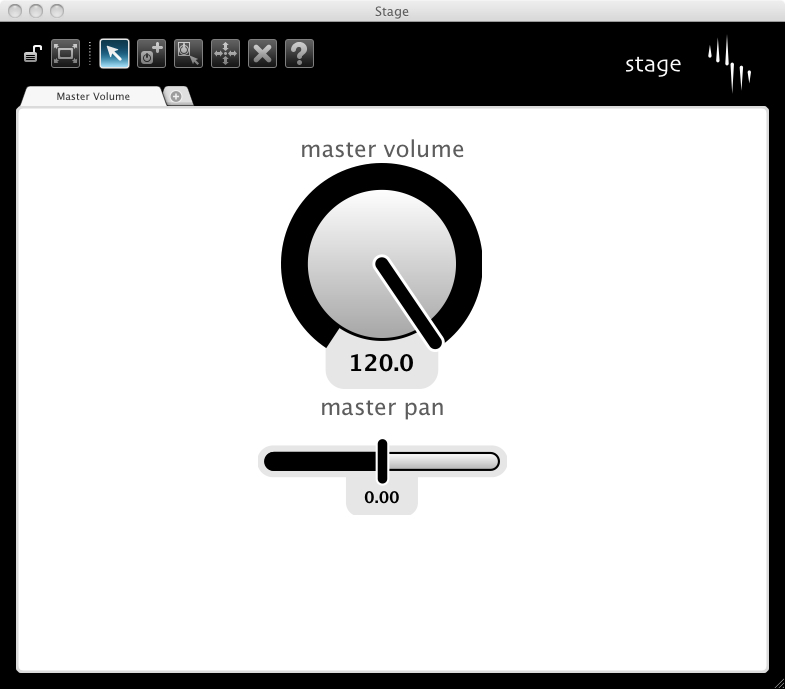 Stage is an application designed to run in conjunction with the main EigenD application which allows for the control of parameters within EigenD using 'Widgets' on a number of graphical canvases, or 'Tabs'. Stage can be running alongside EigenD on the same computer, or in future releases on a different computer on a network or even on an iPhone or iPod touch, allowing many possibilities for control whilst performing with the Eigenharp. To open Stage, click Tools->Stage in the main EigenD menu. Alternatively, Stage can be started as a standalone application by launching Eigenlabs/[release]/Stage from Applications on Mac OS X or from the Start Menu on Windows. Note about keyboard shortcuts: in the Stage wiki documentation, keyboard shortcuts are denoted by 'cmd' followed by a letter key to press. On Mac OS X, hold down the cmd/Apple key followed by the letter key. On Windows, hold down the ctrl key followed by the letter key. Stage currently runs on Mac OS X and Windows. A version for iOS to enable Stage to be used on the iPhone, iPod touch and iPad is currently under development. You will notice the configuration toolbar in the top left hand corner of the window, and the main body of the window contains the tab canvas. You will see that you have one tab available by default in the pico 1 factory setup as an example layout. 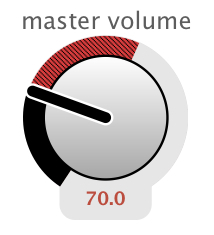 This contains two 'widgets' that control the master volume and the master pan of the pico 1 setup. Other factory setups currently contain empty tabs. The toolbar found in the top left of the window is used to control all aspects of the Stage application. The tools act on elements within the canvas by clicking the left mouse button. A right mouse click in the canvas will pop-up a menu to allow a tool to be selected. The Canvas Lock is used to lock editing of your Stage canvas and puts you into 'performance mode'. When in performance mode, you can adjust the values of the widgets on the currently selected tab and switch between available tabs. To toggle the Canvas Lock: click on the padlock icon to the far left of the toolbar, select 'Lock Layout' from the Edit menu or press 'cmd-L'. When the padlock is in the 'locked' position, you are in performance mode, and when in the unlocked position, the other editing tools will appear to the right of the toolbar. Full Screen mode maximises the Stage window to fill your current screen and removes the Apple Dock and Menu bar to give you maximum viewing area, ideal for performance. Full Screen works independently of the Canvas Lock. To toggle Full Screen mode on/off: click on the toolbar icon selected above, select 'Full Screen Mode' from the View menu or press 'cmd-F'. The Perform Tool allows you to temporarily enter 'performance mode' whilst editing your Stage canvas. To activate the Perform Tool, click on the toolbar icon selected above, select 'Perform' from the Tools menu or press 'cmd-P'. The Create Tool is used to create 'widgets' which control parameters with the EigenD setups. To activate the Create Tool, click on the toolbar icon selected above, select 'Create' from the Tools menu or press 'cmd-C'. This window provides you with a list of all the Agents within your EigenD setup. To view the Ports associated with an Agent, click on the '+' to the left hand side of the Agent name. This will expand to produce a list of Ports. Ports that are available for use with a Stage widget will appear in solid black in the Agent window; Ports or Agents that are not available for use with Stage are greyed out. 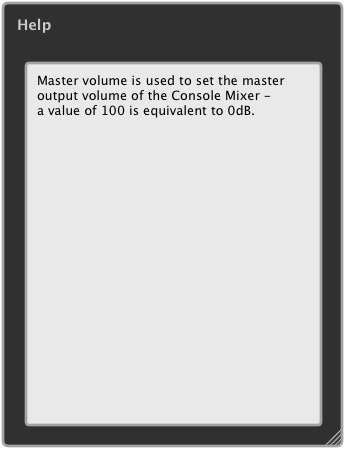 To create a Stage widget for a Port that is available for Stage control, click on a valid parameter within the Agent window and drag the text onto the current tab canvas (An example for this would be to expand 'console mixer 1' within an EigenD setup and drag 'master volume' across to the current tab canvas). When you release the mouse button, you will see the default widget type for your parameter appear on the current tab canvas which will be displaying the current value of the selected Port. Alternatively, the Agent Port can be first clicked on then the desired position on the tab canvas clicked to create a widget. Note: after a widget is created the tool mode will automatically switch to the Size/Position Tool to allow the widget to positioned and sized. The Edit Tool is used to edit widgets and tabs in your Stage window. To activate the Edit Tool, click on the toolbar icon selected above, select 'Edit' from the Tools menu or press 'cmd-E'. This allows you to edit the widget label text and position, the widget type and whether the widget is enabled. For more details about the available widgets and these properties, please see the Widgets article. 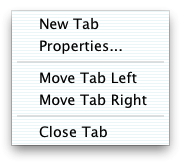 This allows you to add a tab, edit the tab properties, move a tab left or right and delete a tab. For more information about tabs, please see the Tabs main article. The Size/Position Tool is used to move and resize your widgets on the current tab. To activate the Size/Position Tool, click on the toolbar icon selected above, select 'Resize' from the Tools menu or press 'cmd-R'. Clicking in the centre of a widget will allow you to drag it to the desired position on the canvas. If you hover the cursor over the yellow widget border, you will see the the cursor image change - you can now click and drag the edges of the widget to resize it to your liking. To adjust the size of the text accompanying the widget, click and drag the yellow line running underneath the text. The Delete Tool is used to remove widgets from the current tab. To activate the Delete Tool, click on the toolbar icon selected above, select 'Delete' from the Tools menu or press 'cmd-D'. Click on a widget in the current tab to delete it. The Help Tool is used to assist you in the use of Stage. To activate the Help Tool, click on the toolbar icon selected above, select 'Help' from the Tools menu or press 'cmd-H'. To find out more about a part of Stage, click on it while the Help Tool is active to reveal more. For example clicking on a widget will display help about the port of the agent that the widget controls (note: the Help Tool documentation is still in progress and therefore may not yet be available for some elements). This is a broad overview of the Stage application. For more details about different widget types and configuring tabs, please see the separate articles detailed below. 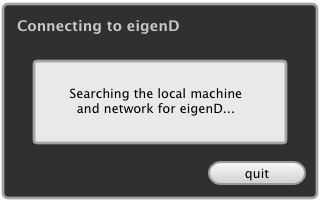 Stage interfaces with EigenD by using a network protocol. This allows Stage and EigenD to run on separate devices across a network - this could be on separate computers, or with Stage running on an iPod, iPhone or iPod touch. Currently, Stage will connect to the first EigenD it finds. Please Note: Currently only one instance of EigenD can be used on a network at once, but multiple instances of Stage can be used together. If Stage or EigenD become disconnected from each other on the network, Stage will display the above connection dialog and prevent any further changes until a connection is established with EigenD. A common case for this to occur would be if you were running Stage on a laptop and move out of wireless range. If the connection to EigenD is lost, e.g. if EigenD is shutdown on a remote system, then Stage can be quit using the button on the connection dialog. Note: Stage is designed to dynamically synchronize with the EigenD host it is connected to. This allows Stage to dynamically synchronize with any Belcanto commands or other instances of Stage manipulating the parameter values or instances of agents in the setup. When EigenD is loading a setup, Stage will likewise dynamically synchronize with the progress of the setup loading. It will not represent a complete setup until the setup is completely loaded. As Stage communicates with EigenD across a network, it is possible that delays can occur as the data travels through the network. For example, is a widget value is changed (see Widgets) then there could be a small delay before the new value reaches the EigenD host. To indicate when widget values have successfully been updated in EigenD, the widgets show graphically when the new value has been received by EigenD. This is done by turning the elements that display the current value in EigenD red when it does not match the new value. When EigenD confirms it has received the new value, the current and new values are the same, and only the current value is visible in black. Here the desired new value is shown by the black circular track and the position of the pointer. The current value is indicated by the red hatched circular region, where the red region shows the difference between the current and new values. As EigenD receives values, the red region will 'catch up' with the pointer. Additionally, the numerical value shown on the widget will show the current value in red until the current and new values are the same, at which point it will turn black. An impression of the 'network latency', or the delay through the network, can be gained by seeing how the red current value tracks the black new value. Although these delays are usually fairly small, when operating on the edges of the range of wireless networks, the data transmission can become intermittent and in the worst case data can be lost when just out of range. In these situations, the graphical confirmation of received values by EigenD shows clearly the value that is set in EigenD. As an example, if sounds in a performance are set to be muted by Stage running on an iPod in wireless network, then it is important to be sure that EigenD has successfully received the data to mute them. If values are not received, Stage will keep retransmitting the new value until EigenD confirms it has received it. So, if a value is lost on the edge of a wireless network, then the device running Stage simply needs to be moved back within wireless range for the desired values to be set.